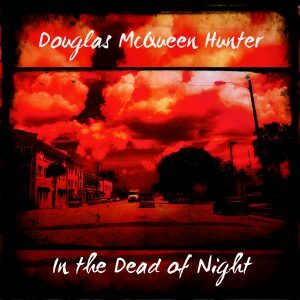 “In the Dead of Night” is the second solo album from Douglas McQueen Hunter featuring ten new songs and an instrumental track. The album has a more mainstream rock sound than Hunter’s debut album “Ghosts” which was a fusion of rock, folk, Celtic and trance. “In the Dead of Night” is a rawer sounding album; more Americana than Celtic and more country-rock than folk. The bagpipes, fiddles and whistles have been replaced with mandolins, five-string banjos, telecasters and Les Pauls, but the sound and arrangements still remain true to the lyrics and compositions of Douglas McQueen Hunter. Like the “Ghosts” album “In the Dead of Night” was recorded, mixed and programmed by Stuart Glasgow, who also played drums and several instruments on the tracks. He was also co-writer of the track “Fat Boy”. Stuart wrote a guitar riff which Douglas McQueen Hunter composed the melody and words over. All other tracks were written by Douglas McQueen Hunter. As for the material there are several recurrent themes running throughout the songs on the album about travelling, being on a journey, contemplating and searching for unrealized dreams. The subject matter of the songs ranges from the search of dreams and ambitions In “American Dream” to the suggested supernatural themes in “In the Dead of Night” and “Nightmare”. It ranges from being stuck in traffic in the rain contemplating on life and unrealised dreams in “Another Rainy Day” and “Contemplating” to driving beneath blue skies by the ocean and in the city on summer days in “Summer Skies” and driving with tired eyes on long dark roads in the early hours heading home after gigs in “Town after town”. The second song on the album “Don’t Cry” deals with love and being parted, “One More Chance” is a song about forgiveness, while “Fat Boy” is a song dealing with health and fitness issues. Listen on Spotify or download it from iTunes.